Tales From Xira | Tellin' tales about writing. It’s Christmas time again. And right now I am sitting in the kitchen, which is lit by dozens of little twinkle lights on a copper strand. I have to say of all the decorations lights remain one of my favorites. The lights shine out against the dark. They glow with many colors and cause smiles to break out. I was contemplating some deeper message, you know about the ongoing battle between the light and the dark. Yet that message is constantly being fed to us 24/7, without end, in bit-sized pieces and across every conceivable media. May your days be filled with the happiness of home and family, new experiences and fond reminiscences of old. I hope for everyone glad tidings and joy, peace and goodwill. To you, dear reader the best and blessed of the whole season. Chasing Rabbits into a Hutch. Let’s be honest, it has been a while. Suffice to say that things are busy as things tend to be when life is being lived. Hopefully, lived well. Anyway, several other bloggers have both overtly and unconsciously prompted me to put keyboard to Text Editor, and well, here we are. First the state of my writing. Egads! I am still thrashing my way through the sixth story in “The Curriculum Vitae of Ignatius St. Eligius” series. I do not know why, but I am stalled a little more than halfway through. Part of the problem is other writing projects. Chris Stocking’s post on Snapshot Fiction outlines ‘chasing rabbits’ and the benefits of flash fiction. I enjoy flash, it is concise and evocative and truly tricky. My problem is that I have a number of side ‘rabbits’ that are not flash length. Shall we do a summary, yes I think we shall. Episode 6 in the Curriculum Vitae of Ignatius St. Eligius. As mentioned, I am more than halfway through. Though halted at the moment. My episodic steampunk tale is nearly at an end, but I just cannot seem to bring it ’round to a close. Mark 4.0. This is a successor to the Curriculum Vitae in that it takes place a number of years after (about 25-30). It is a three part novel centering on one of the Automata that found their beginnings with Ignatius’s fellow inventor Johnathan Fawkes. I am about four or five chapters into the first part. There are fragments of parts 2 and 3 floating around. I wrote and completed a short story associated with Mark 4.0. The Missionary Man. A steampunk/weird west tale. I have been thinking about him and another blogger said that she’d read an entire novel about him. Well, that got me thinking and starting to outline said novel. And then there is a Young Adult project I want to write, but haven’t started quite yet. Oh, I mean other than the first few pages. And actually, truth be told there is at least two other YA projects. The second BIG THING, my e-book ‘Of Man, Myth and Automata’ received a very glowing review from fellow blogger: Anneque Malchien. You can read the full review Over Here. I was surprised and thrilled at the review, so a huge Thank You to Anneque for both reading and writing. I have submitted the novella, ‘A Chemical Confusion’ (the first in the Ignatius St. Eligius series) for publication consideration over at Brigantine Press. Fingers crossed and all that! Coming soon, a full review of the latest version of Draft. I have used it for a while now, and I have to say it’s pretty nice for writing. A lot of features and since it is browser based, runs just about anywhere. It feels good to post again, I will make an effort to not let as much time lapse again. Of Man, Myth and Automata – Live! I am thrilled to announce that my collection of short stories went live on Amazon today! I cannot even begin to tell you how thrilled I am to see it there in the search results. But, what I would rather say is how it has been a remarkable journey of discovery. I would explain how much I have evolved as a writer, how much I appreciate the support of my Wife and the writing community. I have met many, many talented and gifted writers online through this blog, through sites like Quantum Muse and the Wana Tribe for Steampunk/SciFi/Fantasy. There are the WordPress bloggers as well. You can check out their links on the right hand side of this page. Be sure to come back Monday for the release! I can’t wait for it. For giggles, here is the original photo that makes up the cover image. Thanks for reading everyone, see you Monday! 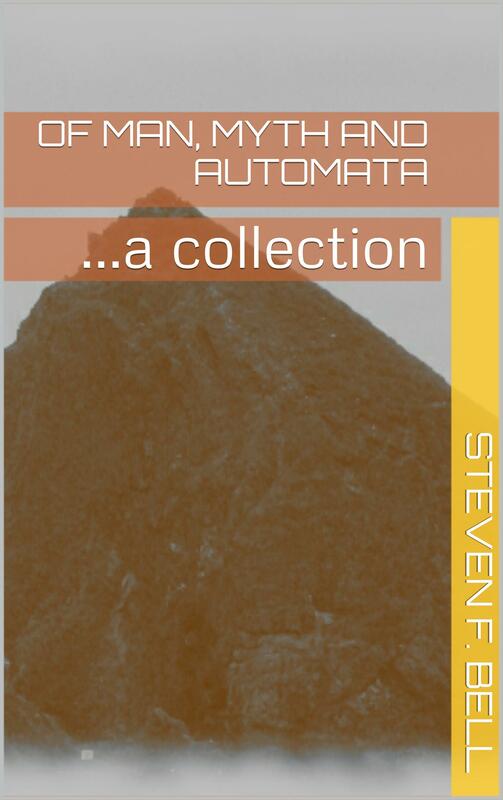 Here we are, rapidly approaching the release of “Of Man, Myth and Automata,” and I’m as nervous as a room full of long-tailed cats surrounded by rocking chairs, closing doors and toddlers with a penchant for grabbing things. Ok, perhaps not THAT nervous. Still what lies ahead on Monday, I cannot take lightly. I am going to publish a book. I would like to be super casual about it, but like many things in life the exhilaration of the newness is arriving. That pang of fear and doubt, the prickling hairs on the nape of the neck, those signs that you are alive and experiencing something new and wonderful…Like kissing that special someone for the first time. Your lips tingled, your heart fluttered, your bodies melted together and you did not want to stop..Ever. Well, I promised a cover, and here it is. I admit, it is fairly straightforward. I used a stock template from Amazon’s KDP site. The photograph is mine though. I washed it through a filter in the GIMP (Gnu Image Manipulation) to give it a weathered ‘old timey’ look. What’s inside? A fair question. The book is a collection of some steampunk, some fantasy, a not so epic poem, a Holiday story or two. Oh yes, a pair of bonus prologues from a story I am working on. It is a bit strange really to have two prologues for one story, but that’s ok. One will be the overall start and the other will be the beginning of a section of the book. The lead story in the collection is one that I am particularly pleased with. And if I am honest, a bit confused about. The main character did not turn out at all like I expected him to. Well, in 5 days you will be able to see for yourself! Please mark your calendars and if you would maybe mention it to a couple of people. I would greatly appreciate it. Thanks everyone, and please…Keep Reading! I wanted to drop a quick post to let you all know that Chris Stocking released his novel: “The Black Powder Brigade” today on Amazon. I just saw a notice from WordPress that I have been blogging here for two years! Zoinks (to quote Shaggy). I enjoy this site and posting the serial novellas, mostly though I have enjoyed the interaction with other writers. To the people following this blog or those who just drop in from time to time, thank you for reading! Follow Tales From Xira RSS style-fu!